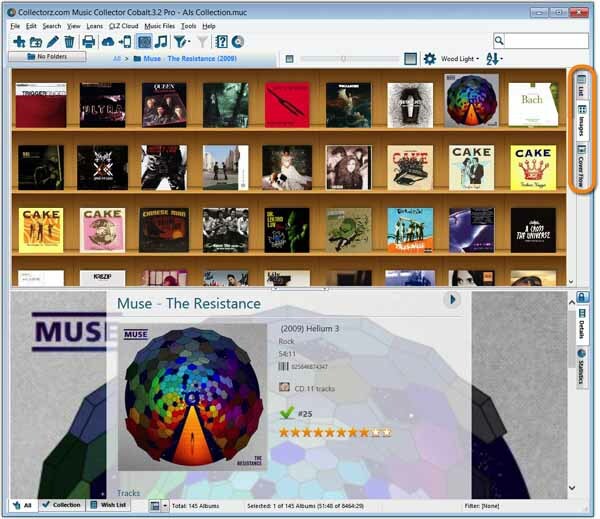 Free download Collectorz.com Music Collector Latest Version.The main screen of Music Collector gives you many ways to view, browse, sort, group and search your database. The screen can be fully configured to your own liking. Switch Music Collector’s main panel (top right) between Images View, a nice wall with cover image thumbnails, or List View. a list with multiple data columns. Browse your albums as one long list in No Folders mode, or group them into folders, e.g. by Artist, Genre, Label, etc.. You can even use multi-level folders, e.g. first by Genre, then by Artist. Manage the items you own and your wish list using the In Collection Status field. Flip between your Collection and your Wish List with the tabs at the bottom left. Use the Quick Search box on the toolbar to search in all fields of your entire database.Or use the Filter screen to build and save advanced filters, using brackets, AND, OR, NOT, equal, not equal, greater than, less than, “contains” and wildcards (PRO edition only). You can now also use the Alphabet Bar to filter on the first letter of Titles and Composers. Use the Settings button on the far right of the bar to switch between Artist, Title and Composer.Hide the Alphabet Bar using the Settings button on the far right of the bar. (show it again using the command in the View menu)the folder list also showed the “other” artists of matching multi-artist albums.